Two of the most beloved and influential artists in the Christian music industry, Bill and Gloria Gaither, have joined with leading Christian publisher, Thomas Nelson, Inc., for the release of The Gaither Homecoming Bible, which becomes available October 9, 2012. As general editors, the Gaithers drew from their years of Bible study, gospel songwriting and strong faith to create this legacy project that is sure to be treasured by believers and all who love to sing their faith for generations to come. With the trusted and beloved New King James text as their guide, the Gaithers worked closely with 60 friends and Homecoming artists to select the 75 hymns and gospel songs that will be interspersed throughout the text. These hymns and songs are given new life and meaning through articles and stories that fully describe their connection to Scripture. In total, 230 exclusive devotionals were penned by Homecoming artists along with 20 original poems by Gloria Gaither. A custom Gaither Homecoming Bible reading plan has also been crafted which will guide readers on a Homecoming journey through the scriptures. The notes and editorial aspects of The Gaither Homecoming Bible show how the Bible passages have changed the lives of Bill and Gloria and the lives of Homecoming artists over the years. The Gaithers desire to lead the reader into a close, personal experience with the scriptures and show how the messages are applicable to everyone’s lifestyle. With overwhelming input from the Homecoming family, including Jeff & Sheri Easter, Mark Lowry, the Isaacs and the Hoppers, The Gaither Homecoming Bible is already having a powerful, spiritual impact on friends of the Homecoming team. Anne Graham Lotz – "Whenever I open the Bible, I feel that I’ve come 'home.' I pray that this Bible will encourage you to read, apply, obey and live by what it says, so that you, too, can come home to a heavenly Father who loves you and wants to have a word with you." The Statler Brothers – "There is a special place in your home for The Gaither Homecoming Bible. Wherever you decide to place it, be sure it’s somewhere accessible whenever you need to be inspired by the true Word of God." Joe Bonsall/The Oak Ridge Boys – "I am constantly amazed at the outreach of our dear friends Bill and Gloria Gaither. They are reaching people with the Gospel through every medium – music, television, video, books – and now this magnificent, simple-to-read and understand version of God’s Holy Word." Andy Andrews/New York Times Best-Selling Author – "Few people in the world of music are as admired, respected, or accomplished as Bill and Gloria Gaither. Their love for the Scriptures and for the Lord is apparent in everything they do. The Gaither Homecoming Bible is a natural extension of their ministry and promises to be a life-long source of study and reflection for all who experience it." 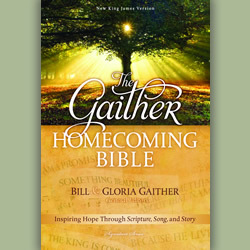 For more information on The Gaither Homecoming Bible and a free download of the book of Psalms, please visit www.GaitherHomecomingBible.com. The Gaithers have produced more than 700 songs, hundreds of recordings, a dozen musicals, and a collection of books for both children and adults. In affirmation of Bill and Gloria’s contribution to the great pool of treasured gospel music, they have been awarded many Grammy and Dove Awards, and the ASCAP Songwriters of the Century Award. They have been inducted into the Southern Gospel Hall of Fame and into the Gospel Music Association Hall of Fame and Museum. The Bill Gaither Trio and the Gaither Vocal Band have also won numerous awards.